Just as traditional astrologers in India have done for centuries, contemporary astrologers all over the world consult the movement of the celestial bodies to suggest the optimal times for marriage or starting a new business. Astrology helps with the timing of things. We can take the help of the Sun, the Moon, and other celestial bodies to help us make choices, and to support us in creating commitments that are as powerful and effective as possible. And now let’s bring the timeless wisdom of astrology to yoga. Every month, the sun enters (called ingresses) a new zodiac sign. For centuries, each zodiac sign has been correlated with an area of the body. Yogastrology works with the traditional correlations between signs of the zodiac and areas of the body to add empowerment and inspiration to the practice of yoga. Take an example: the zodiac sign Leo traditionally has been correlated with the spine. As all yogis know, the spine is key to unlocking the practice of yoga. We may elongate the hamstrings or bring the upper arm bones securely into the shoulder sockets, or we may guide our breath in one nostril and out the other — but all movement ultimately points to the spine. Mobility in the spine keeps us young, healthy, and happy. The spine is the home of the sushumna, which is the primary subtle body energy channel, or nadi. The entire practice of hatha yoga radiates around the spine and the sushumna housed therein. The sushumna connects the base (root) chakra to the crown chakra, and this is an important connection to make in the practice of yoga. 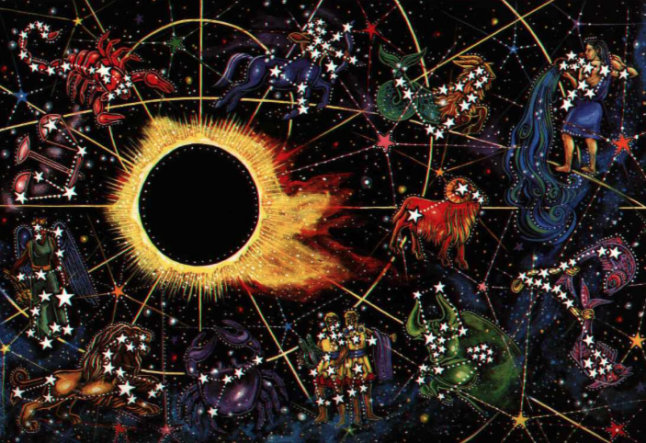 Each sign of the zodiac has a ruling celestial body. And ancient tradition has associated every celestial body with certain human qualities. I love to explore these qualities and understand how they can help us to better know ourselves. Venus, for example, helps us get a handle on our needs and our strengths in the areas of love, wealth, and beauty. The qualities of Mars help us monitor and direct our own tendencies toward assertion, aggression, and passion — necessary when we want to become energized in one direction or another. And the Sun, or course, relates to our radiance. Let’s return to our example: Leo. The ruling body for Leo is the Sun. All movement in the solar system ultimately revolves around the Sun: every planet orbits the Sun. In astrology, the Sun sign (the zodiac sign where the Sun was at the moment of one’s birth) holds keys to understanding the vital life force and revitalizing the essential nature of a person. We know the Sun (which is key to making sense of astrology and comprehending our individual life force) and the spine (which is key to the practice of yoga) both correlate with Leo. That makes the month of Leo (July 23 to August 22) an especially potent time to focus intently — and warmly — on the spine in our yoga practice. In fact, the Sanskrit term hatha (yoga) means Sun and Moon: ha = Sun and tha = Moon. And the Sun and the Moon are merely the beginning of the Yogastrology :: Yoga meets Astrology system. Here’s a chart showing each zodiac sign with its traditional zodiac-body correlation, and ruling celestial body. For each zodiac sign, I’ve noted the Yogastrology theme. These themes guide us more deeply into Yogastrology and the nectarian bliss of the yoga + astrology practice. Gemini. Shoulders. Mercury. Mindfulness & Ease. Leo. Spine. Sun. Courage & Humility. Libra. Lower back. Venus. Giving & Receiving. Scorpio. Pelvis. Mars & Pluto. Transformative Breath. Aquarius. Ankles. Saturn & Uranus. Strength & Unity. Pisces. Feet. Jupiter & Neptune. Foundations. How does it feel when your inner universe is in alignment with the outer universe? Yogastrology is your guide.